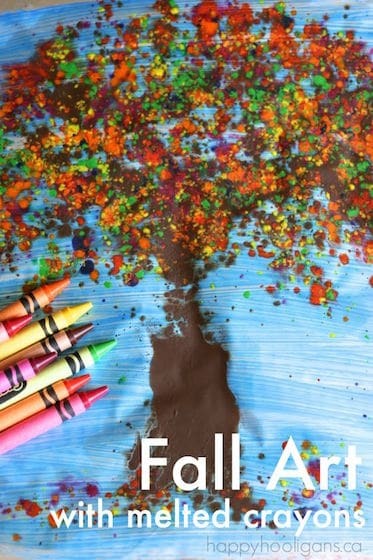 6 fall tree crafts for preschoolers and toddlers to make! 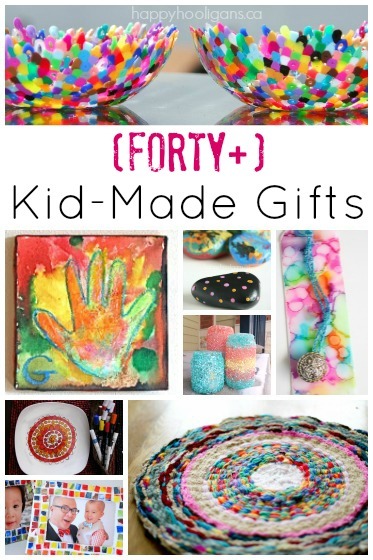 A fun collection of easy, inexpensive fall craft ideas for kids! 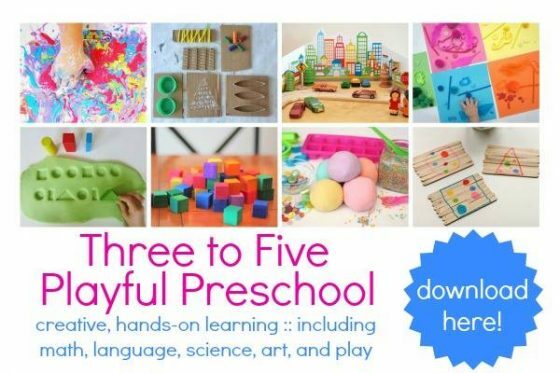 Fall is a terrific time for observing leaves and trees with preschoolers. It’s the time of year that our trees become most obvious to us because of the vibrant colours they display as we move further into fall. In our backyard, our maples and our oak are beginning to shows tinges of red and brown in their leaves, and the colour of our honey locust is changing quickly from green to yellow. That particular tree is always the first to turn, and the first tree to lose its leaves. Its branches will be bare by the end of September, while the birch trees and the maples, oaks and poplars hold onto a little longer. Because the leaves on the trees are so beautiful at this time of year, and because the process of the leaves changing colours is a fascinating one, we do a lot of crafting with fall trees in mind in September. 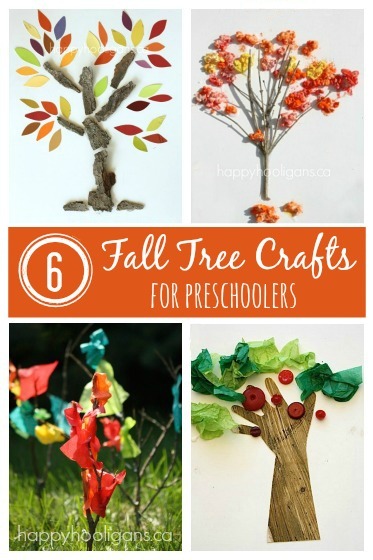 Today I’m sharing with you, 6 of my favourite fall tree crafts for preschool. 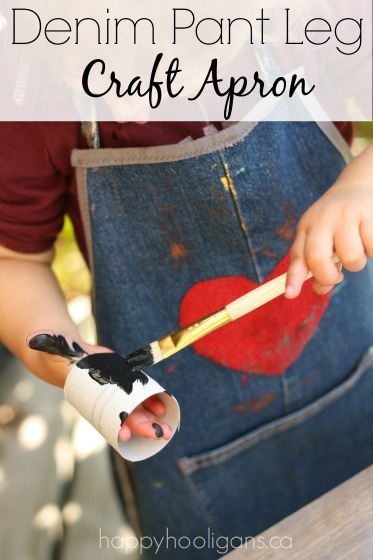 These crafts are all easy and inexpensive, and they’ll allow your child to explore, create and celebrate the colours and textures of fall. 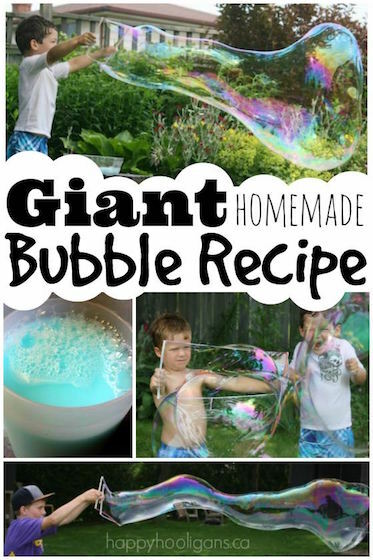 Each of these photos and descriptions contain clickable links which will take you to the full post with the details. 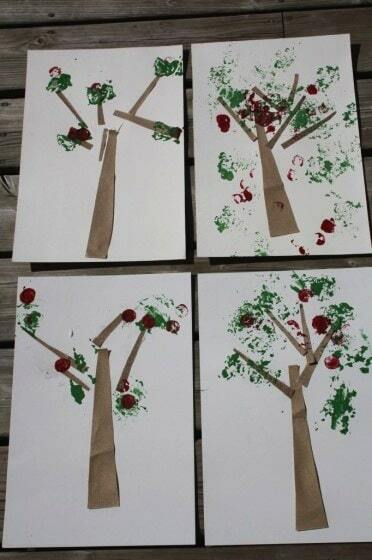 Textured wallpaper samples, tissue paper and buttons add a sensory element to these adorable handprint apple trees! 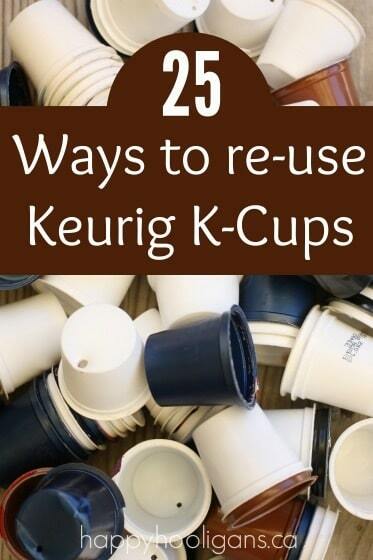 Don’t throw out that left-over popcorn! 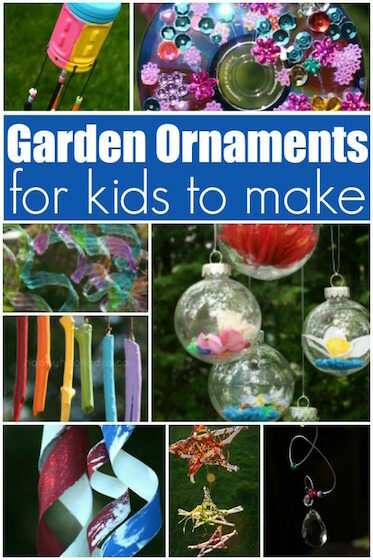 Colour it (the kids will love this process), and make these vibrant popcorn trees! One of my all time favourite Autumn crafts here in my home daycare: fall tree table toppers made with tissue paper and twigs. These sandpaper apple trees provided the opportunity to explore textures and some fun painting techniques. 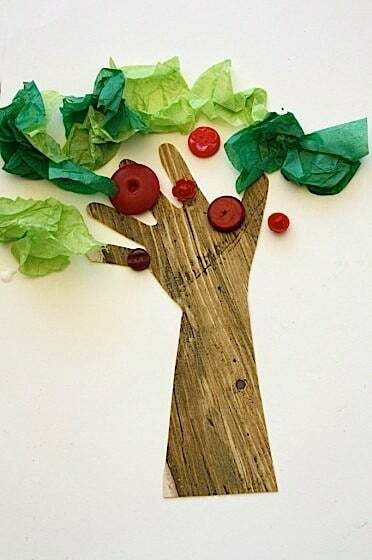 I love this paint chip tree craft. The hooligans made fall collages with their materials, while I made this lovely tree adorned with colourful paint swatch “leaves”. 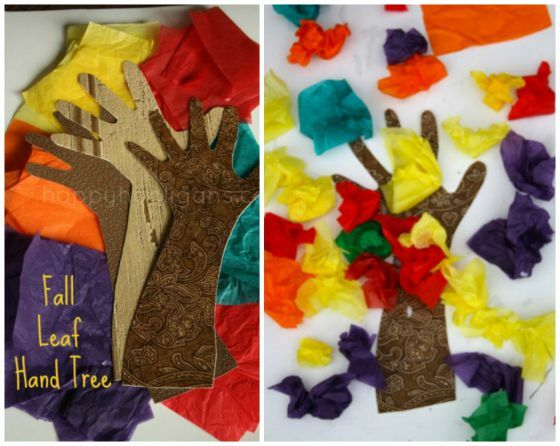 And one of my favourites: This Tissue Paper Hand Tree. I love the vibrant fall leaves falling from this little handprint tree. 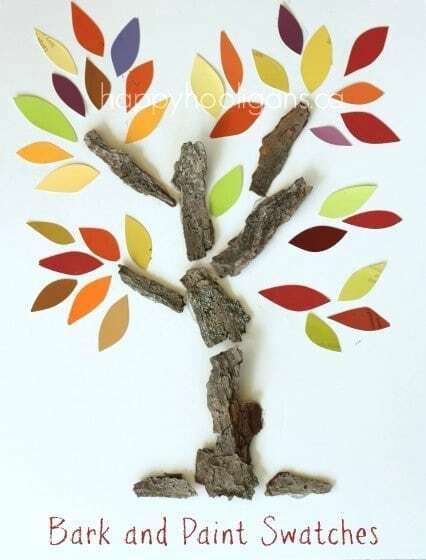 BONUS: Here’s one more fall tree craft to add to the collection! 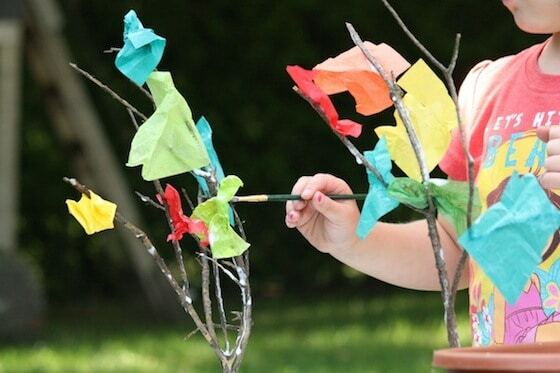 We made these melted wax fall trees with our broken crayons, and the results were gorgeous. 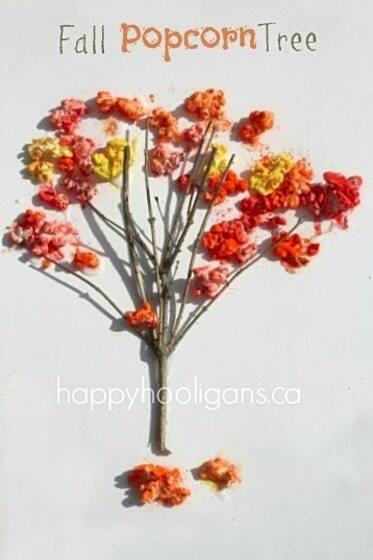 I hope you and your hooligans enjoy making these fall trees as much as we did!